After Orchid defeated Eyedol in Killer Instinct, a time portal was opened, transporting the fighters 2000 years into the past and freeing the Demon Lord Gargos from Limbo. Now	both	surviving fighters and the new challengers must battle for the right to face Gargos and bring an end to his evil reign. Each character has a specific set of attacks and defensive strategies, but the challenge comes in mastering each characters special combos and finishing moves. Each character has several but they require complex button combinations. 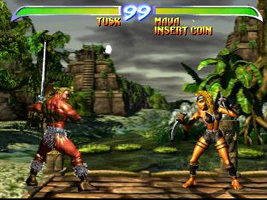 The game also comes with a multiplayer mode and a range of tournament options.